The first quarter of 2017 was a mixed one for US mobile operators. It was a a very good quarter for T-Mobile and better than usual for Sprint. Verizon and AT&T underperformed this quarter. Only T-Mobile gained both total customers and postpaid customers last quarter. 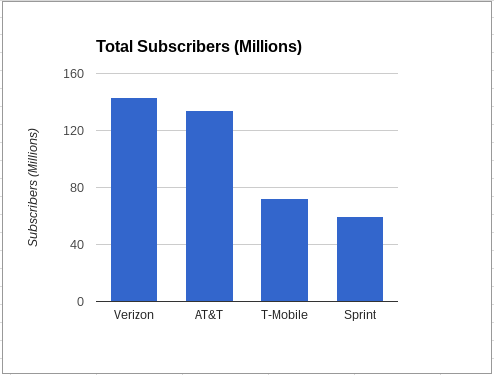 Sprint and AT&T lost postpaid customers but gained in total customers while Verizon experienced declines in both. AT&T and Verizon blamed their weak performance and their failure to respond quickly enough to T-Mobile's unlimited plans. T-Mobile added 914,000 postpaid and 386,000 prepaid customers but lost 158,000 wholesale customers for a total gain of 1.14 million customers. That compares with gains of 2.1 million in Q1 2016 and 2.2 million a year ago in Q1 2016. AT&T lost 191,000 postpaid and 582,000 reseller subscribers, but gained 282,00 prepaid and 2.57 million connected device customers for a total gain of 2.08 million subscribers vs gains of 1.52 million in Q4 2016 and 1.78 million in Q1 2016. Verizon lost 307,000 postpaid connections and 17,000 prepaid customers for a total loss of 324,000 vs gains of 582,000 in Q4 2016 and 436,000 million in Q1 2016. Sprint reported adding 180,000 prepaid and 125,000 wholesale customers but lost 118,000 postpaid users for a total gain of 187,000 customers vs gains of 577,000 in Q4 2016 and 447,000 million in Q4 2015. Verizon made a profit of $3.5 billion last quarter compared with $4.6 billion in Q4 2016 and 4.4 billion a year ago in Q1 2016. AT&T made $3.5 billion last quarter compared with $2.4 billion in Q4 2016 and $3.8 billion in Q1 2016. T-Mobile made $699 million last quarter compared with $390 million in Q4 2016 and $476 million in Q1 2016. Sprint lost $283 million compared with losses of $479 million in Q4 2016 and $554 million in Q1 2016. *Estimated. Verizon doesn't report wholesale customer numbers. Verizon reported 113.9 million retail connections at the end of Q1, 2017. I estimate that Verizon has approximately 143 million total subscribers, including wholesale connections. América Móvil's Tracfone subsidiary lost 1.3 million subscribers last quarter. That compares with a loss of 417,000 in Q4, 2016 and a loss of 458,000 in Q1, 2016. TracFone blamed most of it's loss this quarter on customers of it's SafeLink Lifeline brand failing to recertify their eligibility for the federal and state program which provides free service to low income families. TracFone's revenue of 1.98 million this quarter was down 6.2% compared with last quarter but up 13.1% compared with the first quarter of last year. TracFone operates the Straight Talk, NET10, Tracfone, Simple Mobile, Page Plus, Total Wireless, Telcel America, Walmart Family Mobile, GoSmart and SafeLink Wireless MVNO brands in the US. Postpaid phone customers are generally much more profitable than tablet, connected device, prepaid and wholesale customers. Industry watchers put a lot of emphasis on postpaid phone customer gains and loses. T-Mobile once again lead the pack and added the most postpaid phone additions for the 12th consecutive quarter in a row. Verizon and AT&T lost postpaid phone subscribers this last quarter. The number of branded prepaid customers decreased by 469 thousand, the first quarterly decrease in three years. The loss came primarily from TracFone which lost 1.3 million prepaid customers. In summary, T-Mobile once again lead the industry in all four main growth metrics: total customer adds, total postpaid adds, total postpaid phone adds and total prepaid additions. AT&T and Verizon are highly profitable but Verizon lost total customers for the first time in many years. AT&T lost lucrative postpaid phone subscribers as well as over 580 thousand wholesale customers. If it were't for the addition of 2.57 low value connected device customers, AT&T would have suffered an overall customer loss as well. Sprint lost a little less money than usual last quarter and finally gained prepaid subscribers after seven consecutive quarters of prepaid losses, but lost postpaid subscribers, mainly tablets. TracFone lost a whopping 1.3 million customers but still increased revenue year over year. Thanks, Dennis, for the excellent article. The losses for TracFone is big but not surprising. It seems like one of the biggest retailers of TracFone products like Straight Talk, Walmart, would remove such a product with poor customer service. But people vote with their feet. Hence, the lower numbers and lost customers. Why is Tracfone listed as a separate carrier? Do they have their own towers in the USA? Because tracfone is huge in the prepaid market and this is a prepaid phone site. As you can see above Tracfone has the most prepaid customers. Yes, Tracfone is huge but are they a separate carrier in the USA? I think that they use Sprint, Verizon and AT&T towers just like other MVNOs. I suspect that Tracfone is listed separately because it is difficult to sort out how many of their customer are on which real carrier. No, they aren't a separate carrier and don't own their own towers. They are the largest MVNO in the country, so worthy of inclusion here. I'm glad Dennis' report includes them, as I use their services too. Yes, Tracfone is a carrier. A MVNO is a carrier that has a business relationship, a reseller agreement, with a mobile network operator (MNO). A MVNO is not a wireless carrier. "Yes, Tracfone is a carrier. A MVNO is a carrier that has a business relationship, a reseller agreement, with a mobile network operator (MNO). " CBS News article on Google fi, e2Campus, Digital Trends. So much noise over something so inconsequential. Don't you two have anything better to do? CTIA, the Wireless Association; WIRELESS GLOSSARY OF TERMS: Carrier: Also known as service provider or operator, a carrier is the communications company that provides customers service (including air time) for their wireless phones. "So much noise over something so inconsequential. Don't you two have anything better to do?" I'm really taken back by your inconsequential non-response here. Horrible vacation or what? Why bother to even post? Some of us like to learn and use correctly terminology. I'm sorry if I offended you but I found the repetitious "I'm right, your wrong" back and forth arguing a waste of everyone's time. To me at least, carrier and operator are generic terms. An operator can be a MNO or an MVNO. As the CTIA reference notes, carrier a synonym for operator (which can be a MNO or a MVNO). TracFone is an MVNO and can be called either an operator or a carrier. Looks like ATT and TMO are on the clear victors for this quarter. Tracfone seems to have been pulling a fast one on the tax payer. I hope this is being looked into. Done. We're seeing the results. The drop-outs didn't qualify in the first place, and still don't. They don't have the paperwork to submit under the new approval process. 'Obamaphones' Lost. The FCC under Wheeler spent $50M (taxpayer money) to study fraud in this program last year. As if they didn't know that if you don't verify, you can't really trust companies and subscribers who benefit from not verifying. Do the ATT numbers include Cricket? Yes, of course. Cricket is just a brand that AT&T uses for prepaid service. Sprint numbers also include Boost and Virgin and T-Mobile numbers include MetroPCS. "Sprint reported adding 180,000 prepaid and 125,000 wholesale customers but lost 180,000 postpaid users for a total gain of 187,000 customers"
Where'd the extra 67k come from? "América Móvil's Tracfone subsidiary lost 1.3 million subscribers last quarter." Blamed on Obamaphones, but it could just be their terrible service, uncompetitive pricing and lack of customer support. "Verizon lost 307,000 postpaid connections and 17,000 prepaid customers for a total loss of 324,000"
So by not competing in the prepaid arena, they're losing hundreds of thousands of postpaid customers and passing up the opportunity to snag the up to 67.4 million prepaid customers which would more than cover those losses. Well then, I suppose that's one way to phone it in. Sprint actually lost 118,000 postpaid customers not 180,000. The post has been corrected. Thanks for reporting the discrepancy. Verizon execs look like those two old Muppet guys in the balcony. Who's laughing now from your high perch? Where's the stats for uscellular? I have free gov. Subsidised phone. From Tracfone. How does that count. TracFone SafeLink Lifeline customers are counted as TracFone customers.